DevOps, DevOps & more DevOps – are you sick of hearing it yet? I’ve heard a few different definitions of this but at a high level I’d describe it as bringing together development environments, physical environments and processes to enable apps to be delivered quickly! … it’s containers that is facilitating this! I won’t go into detail on what containers are here as there’s plenty of resources out there… When we think about the benefits that containers bring, we have app portability, we have consistent behavior, no need to troubleshoot environment issues, lightweight (enabling near instantaneous starting of apps compared to minutes with a VM) and greater efficiency (ability to run 5-10 times more containers than VM’s). All of this sounds amazing and truly enables business agility! Management & control: Containers provide all the control to a developer! Operations teams no longer have control over the environment and this isn’t going to work in an enterprise organization… Ops still need to know, manage and plan for resource requirements, have visibility of where apps are and what they are doing etc. Skillset: This technology although powerful is widening the skillset of a developer, potentially pulling them away from their core competency. As this technology is still relatively new in the market it can also be difficult to find enough resources with the required skillsets, or require significant investment in training. 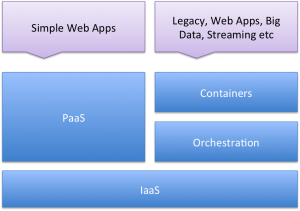 This is where enterprise PaaS solutions (such as Pivotal Cloud Foundry) can help! It’s built using containers so will reap all the benefits of containers whilst providing control back to operations teams and removing the complexity from developers. Buildpacks: PCF will dynamically examine code and work out what runtime and middlewear is needed then build a secure container based on the content! Health: PCF will monitor the environment comparing the expected state to the actual state, in the event of a mismatch it will send alert and request for the controller to fix it! Services: It’s possible to provision data services such as Redis Cloud, ClearDB (MySQL) and many more! It’s also possible to have custom data services that might connect back to an on-premises database. It’s like an app-store where services can be requested and provisioned from within PCF GUI or CLI. Security: Could write a whole post on this…! In a nutshell all components run on a VM which exists on a VLAN to automatically provide isolation, all internal traffic is over NAT meaning that we don’t have to expose a public route. and much more… but I won’t go into everything here! All of this can be deployed and ran on a choice of IaaS stack including VMware, Openstack, Amazon EC2, Google and now Azure (currently in Beta), meaning there is no lock-in providing the opportunity to leverage cloud economics with the ability to very easily move to a different provider in the event of price changes. No code changes are required, simply stand up another PCF instance within another cloud provider and push apps here instead. In a nutshell PaaS offers simplicity (hides complexity from developers and provides control to Ops) where as containers provides granular control and flexibility.